For the past few months, I have been running in circles trying to materialise my thoughts on art valuation and exhibitions. Vastari is exploring some interesting new business models and propositions in 2019, but there is one issue that I keep getting stumped at, and I’d love to push it into the world of the internet to explore if some sensible answers come my way. The myth that exists currently in the private art market is that art appreciates in value simply by holding it over time. You buy an important work, put it into a bonded warehouse, in Switzerland or elsewhere, bring it back to the market in 20 years and it will have increased in value. So many collectors I come across are worried about ‘burning’ the works that they have carefully kept from the market for many years, and want to have a grand fanfare when they decide to sell it again. The truth is, that this story is probably true for the top 1% of art in the world. If you have one of the most important works by an Old Master still in private hands, and the rest of the works are owned by museums, then perhaps bringing them back to the fore after decades in storage will bring value. But really - even in these special circumstances where this is true - it is because of the fact that the work is on display, even if it is in storage. On storage while it’s on display? What kind of parallel universe is that? Let me explain: the only reason that holding a work in storage over time makes sense, is because other comparable works by the same artist are on display at museums around the world. If the public display of works didn’t exist, if that Cézanne “Card Players” was not on display to the public, then the one you bring out of the woodwork in 10 years’ time will not be as valuable. Currently, that value is connected through what I would call “monographic ties” - ties for works made by the same hand. What I mean by that is that if Cézanne is on display at the Courtauld and the Met and the Barnes Foundation, then the next Cézanne will also be interesting, because they are linked together as being by the same artist. Then it becomes even more interesting if there is an overlap of “monographic” and “subject” ties. If it is a work by Cézanne that also is on the subject of the “Card Players” that comes onto the market, where there are only 5 “Card Players” in the world, four in museums and you have one of them, then it is even more valuable. Arguably, the “subject” ties without a monographic one, should also work. If there is a famous work about the Spanish revolution, other works about the subject should also be valuable. 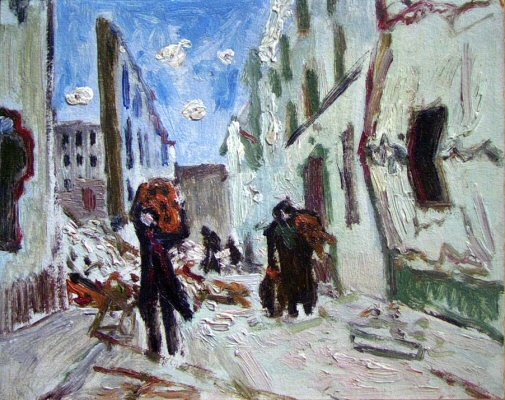 But the art world doesn’t quite work like that - the Guernica is significantly more valuable than this painting by Midelfart of the Streets of Madrid at the time, or this later rendition of the war by comic artist Graham Coton. Current indexes used for valuation use monographic ties, either by indexing Warhols’ sale value over the years like they do on MutualArt and artnet, or looking at the performance of works by Warhol at auction comparing the estimate to the hammer price like they do at Pi-ex. But reverting to the Cardplayers example - the other 4 Cézannes in museums will (most likely) never come back on the market. These works are affecting the value of the one that came on to the market, because they increase the number of consistent eyeballs that know and recognise the piece. Essentially the “real estate” held by these 4 other pieces, in museums, seen by different visitors around the world, is impacting the value of the work much more significantly than the fact that the work is in storage, hidden from view and brought to the market. There are two main high-profile examples that prove this point: the Steve Wynn “Le Rêve” Picasso and the $450m Leonardo da Vinci “Salvator Mundi”. Both of these works have conservation issues, and have been anything but private. They haven’t been held in storage, they haven’t been hidden from the public. All their ugly and pretty sides have been shown to the world. The best investment strategy to protect the value of a work of art is to have it on display. And if you decide to hide it away in a warehouse somewhere, the next-best thing is to support an institution that displays works with monographic and/or subject matter ties to your own. Now that second example, sounds familiar. Many dealers have supported museums throughout the centuries (just look at the names of some of the rooms sponsored in the National Gallery). Many collectors own things that are in storage somewhere, and then sponsor museums lavishly to show other editions of the work. Yet, everyone feels uncomfortable acknowledging this truth. Museums turn a blind eye to this fact (or perhaps, museum directors are forced to not acknowledge it by their board of trustees). So - Vastari has had to build up a business that works with this inevitable fact that art is more valuable when it is on display, while our users completely deny that this is true. Is it maybe better to start tracking the impact of these donations, this support from the private sector, and consider these contributions as an investment into the art that they privately own as well as a philanthropic activity? How much of the art that is on display today has an impact on the value on what is in storage? Is there really a separation between the private and public sector in the art world?